All About My New Pet Guinea Pigs! All about the newest additions to my fuzzy family. 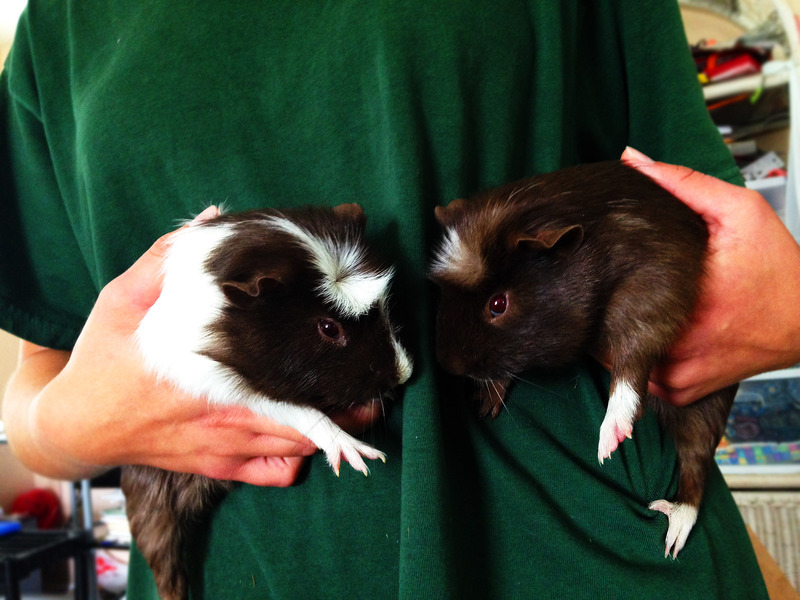 In the middle of August, I accomplished a very long term goal of mine: I got pet guinea pigs! The one on the left is named Moose, & the one on the right is Olive. They are the sweetest little things, each with their own personalities, & they’re getting even cuter as I get to know them more. For a very long time, I’d been thinking about getting a small pet. When I was fourteen, I had a pet rabbit named Indy, short for Indiana Jones. He was the light of my life, but unfortunately passed away suddenly at only six months old. After I grieved for him & was ready to get another pet, I decided on a dog, & got Sparky, my Boston Terrier/Shih-Tzu/Chihuahua mix. A few years passed, & I found myself still wanting a small pet. I love animals, & wanted to add a small pet to my family that would be cuddly, affectionate, enjoy human attention, & be relatively easy to care for. Sometimes, I’d start looking further into getting a small pet, but I never ended up actually doing so. I extensively researched rabbits, guinea pigs, and rats, as they met my basic criteria. One day, after going to the pet store to observe the different types of pets I was considering, it finally became clear to me what type of small pet I really wanted to get. A wonderful guinea pig with black & white Dutch markings put his feet on the cage bars & peered out at me, bold & unafraid. I fell in love with him. After going home & giving it a great deal of thought, I knew guinea pigs were the right kind of pet for me to get. They were easier to care for & more cuddly than rabbits, & they had a much longer lifespan than rats. I decided I wanted to get this guinea pig, as well as a second one, as I knew that most of the time, it’s better to have guinea pigs in groups of at least two. The next day I went back to the pet store. The black & white guinea pig was still there. I held him, & although I was admittedly kind of creeped out thinking he wanted to bite me even though he didn’t (a fear well-founded due to my sister’s pet rabbit, who by no means can be considered friendly), I decided to bring him home. 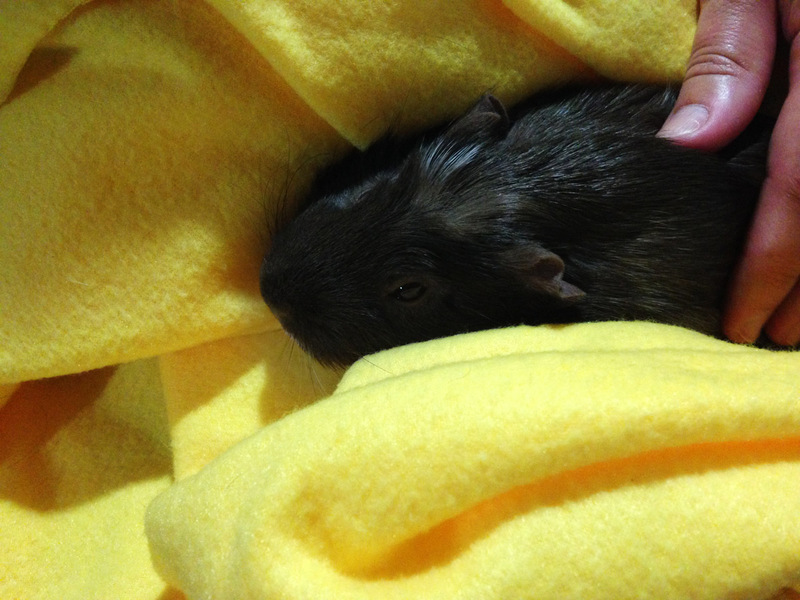 In another cage of guinea pigs, I found an adorable mostly brown guinea pig with a white rosette. He was super-sweet & cuddly, so I decided to bring him home as well. Things didn’t get off to the best start. Even in their cardboard box on the way home from the pet store, the black & white guinea pig was fighting with & trying to assert dominance over the smaller brown one constantly. Things were even worse when I put them in their cage together. The black & white guinea pig continually tried to assert dominance over the brown one, even though the brown one rarely challenged him back. They fought quite a lot, & frequently, whenever the brown one wanted to drink water or eat food, the black & white one would scare him away. The cage I initially put them in was one unfortunately much too small for them, despite having been sold in the pet store as a “guinea pig cage”. This went on for several days. I wondered if perhaps their lack of floor space was causing them to fight. I designed a home for them out of a kiddie pool. After reading on the Humane Society website about how if your guinea pigs really aren’t getting along, you can try bathing them together so they “bond together out of necessity”, & so they smell the same to each other. When I tried this, they were trying to fight in the bath tub. After their bath, they seemed to get along a little better, but a few days later, their fighting was only getting worse. One day in the space of an hour, they had two fights that had to be broken up with my family clapping their hands or tapping on the outside of their cage to distract them from their fight, & the brown one ended up with several small scabs. This resulted in them having to be put in separate cages for the safety of the brown one. It was at this point that I realized they weren’t going to get along. I was conflicted regarding what to do about this. It broke my heart to think about returning the black & white one, now named Oreo, back to the pet store, but I also felt like it would be detrimental to separate them & have the brown one, whom I named Olive, live alone permanently, as even when Oreo was being mean to him, Olive still sought out comfort & contact from Oreo. That evening, I had a light bulb moment. I didn’t have to make either of those choices. I could have the best of both worlds, & make this a win-win situation for all involved. The photo above is from when Olive & Moose were first meeting in their cage. I decided to give Oreo to my sister. Ever since I’d gotten him, she’d adored him the most, as she understood his somewhat nervous, active personality better than I did. The day after I decided what to do, I promptly went to the pet store to look at a third guinea pig. They had adorable baby ones, but because Olive was probably several months older than the babies, I didn’t get a baby one because I was afraid Olive could hurt it. There were quite a few adult ones, but I wanted to get one a similar age as Olive. Finally, I saw a wonderful brown & white rosette guinea pig. His fur was the exact same shade of brown as Olive’s, his eyes were the same shade of red, & his rosette on his forehead was identical. They looked like they could be brothers. This was the guinea pig I decided to get. I introduced Olive & the new guinea pig to him on the carpet. They got along reasonably well, with very little dominance behavior between them. I put them in their cage together, & it was so refreshing seeing them getting along. They did & still do occasionally have small arguments, but they get along so well together for the most part, & both seem happy & healthy. I ended up naming the new guinea pig Moose, after failing to find another name I liked beginning with O for him. Additionally, it’s amazing how much healthier & happier Oreo seems now, living in a separate cage. He actually seems a lot happier living in a cage without other guinea pigs. His cage overlooks the kiddie pool where mine live, so he gets to see, hear, & speak with them still, & my sister is able to spend a lot of time with her guinea pig. At least once a day, we have a controlled playtime for all the guinea pigs, where they can run around on the floor together & interact. Olive snuggling in his blanket on my Mom’s lap. I am loving having guinea pigs as pets so much. They are so cute & so sweet. When they’re out on the floor, my dog likes to gently approach them & just look at them. He finds their sounds the most fascinating thing in the world. Sometimes, he crawls towards them & gently touches them with his nose, or gives them a few kisses on their backs or ears (obviously I am sitting right in the middle of all the pets, supervising them closely). The guinea pigs now are used to Sparky to the point where they will voluntarily crawl towards him & sniff noses with him. It’s the cutest thing to watch. 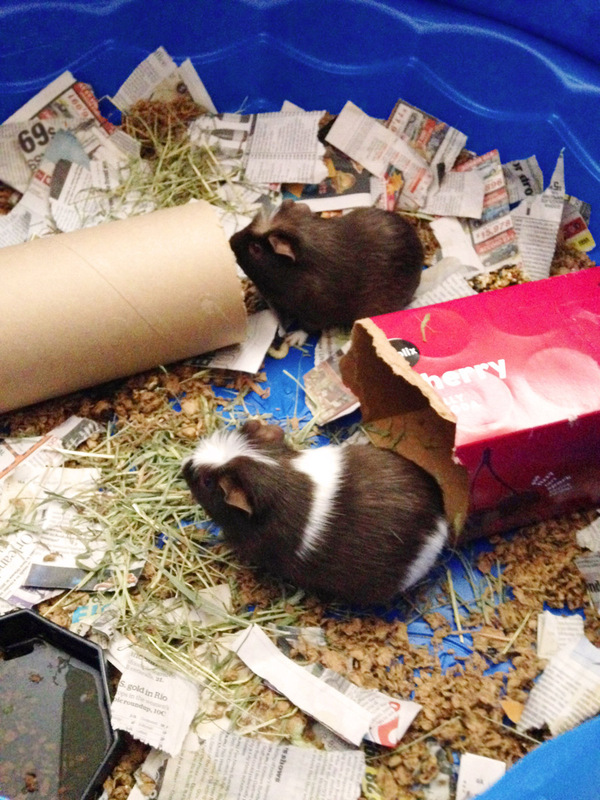 It’s also awesome watching my guinea pigs’ personalities really start to come through. Olive thoroughly enjoys sitting on my shoulder when I hold him on the couch. He perches on my shoulder with his back end under my chin & will sit there for the longest time, sometimes quietly making sounds. Moose recently has started enjoying this as well, & he’ll sit there talking quietly the whole time. They are getting more bold when they run around on the floor as far as walking around & exploring, & they like climbing onto my lap when I sit on the floor by them. Every time anyone in my house touches a plastic bag, even a shopping bag, the guinea pigs started “wheeking” with excitement because it sounds like their hay bag. Moose is definitely the most talkative, & Olive is the most cuddly.